Sunset Durga | Artwork – Store – Tammi B. Ph.D.
Hand painted mandala 18" x 18" acrylic, mixed medium, gold leafing and Swarovski crystals. 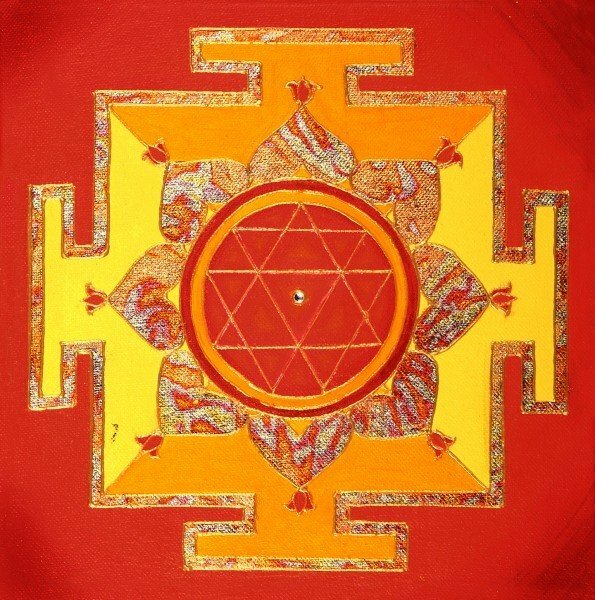 The Durga Yantra is a powerful yantra for attaining desires, to remove difficulties and to conquer enemies. Durga Yantra bestows wealth and prosperity and protects the person from danger. I created this one specifically to more fully claim the quality of courage and ground myself more solidly in the world.